From the popular RoxyAnn, the meat-packed Mt. Ashland, and the veggie-lover’s Table Rock, our pizzas capture the spirit of Kaleidoscope Pizzeria and the Rogue Valley. Each of our pizzas, appetizers, soups, salads, calzones, and desserts are made from scratch daily from the highest-quality and freshest-tasting ingredients. Choose your favorite from our extensive menu, or be original and create your own with our our extensive list of fresh toppings. Our rich and spicy salsa served with multi-colored tortilla chips. An oven-roasted garlic head served with fresh bread, Gorgonzola-basil spread, diced Romas, olive oil and balsamic vinegar. Bleu Cheese, Lemon Poppy Seed, Sesame Soy, Raspberry Vinaigrette, and Ranch. 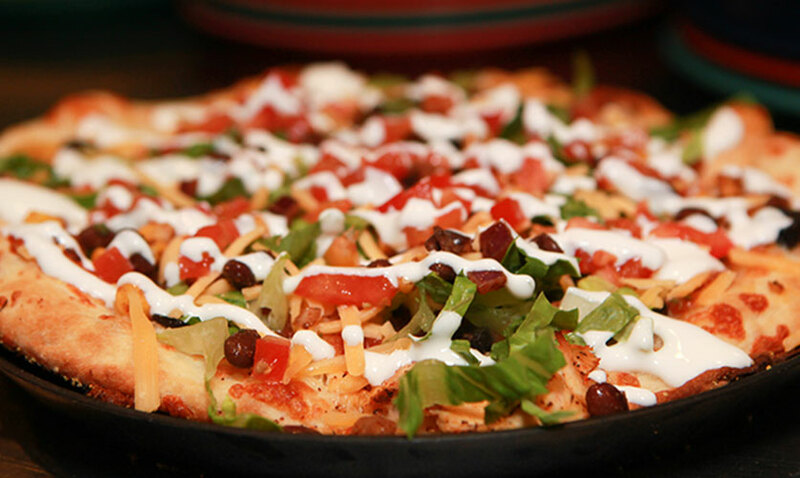 Our pizzas are homemade from the highest-quality, freshest-tasting ingredients. We begin with our unique dough recipe, hand-tossed and made fresh daily, to create a classic thin crust. Select from a unique variety of 100% all natural gourmet cheeses, special sauces, fresh meats and veggies to top it off. Then we stone-bake it to bubbly perfection. Can't decide what to order? Try a half-and-half pizza. Thai Chicken Winner of the Oregon Zagat Award! All pizzas come default with a marinara base sauce and a mozzarella-provolone base cheese mixture. All of our sauces, dressings and marinara are made from scratch in house and are available for sale. Our calzones are baked with fresh pizza dough and shake cheese then stuffed with fresh lettuce. Served with Romas, red onions and pepperoncini on the side (please allow extra cooking time for calzones). Any small pizza can be made into a Calzone. Rich vanilla ice cream combined with Henry Weinhard’s Gourmet Root Beer. (8 oz.) Sorry, no free refills.